Representatives from state historic sites and cultural institutions will provide educational hands-on activities, unique artifacts to explore, and information about upcoming events during the annual “New York State’s Great Places and Spaces” program on Saturday, January 14 from noon to 4:00 p.m. at the New York State Museum. Visitors can learn about New York State history through activities and information provided by over 20 state historic sites, museums, and libraries. In addition, The Iron Jacks, a singing group that specializes in songs about U.S. sailors of the Civil War era, will perform at noon and 2:00 p.m. There will also be a guided tour of the Hudson Valley Ruins exhibition at 1:00 p.m. and 3:00 p.m. and a “hands-on” cart of Native Peoples reproduction objects where visitors can get first-hand experience with materials used by the Iroquois in the past and present. 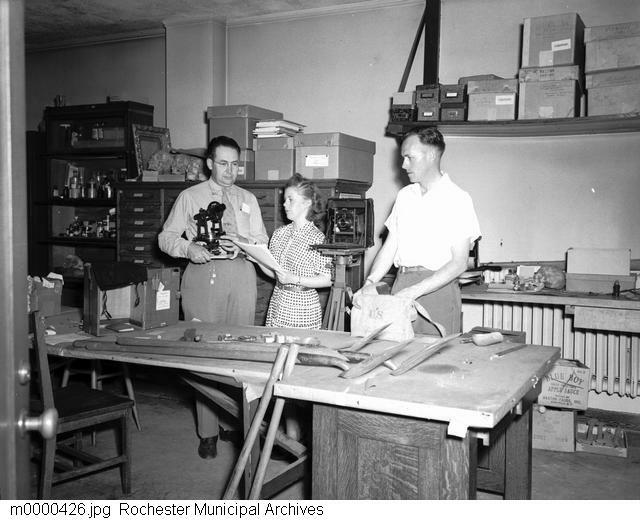 Participating institutions include the Adirondack Museum, Albany Institute of History & Art, Albany Pine Bush, Burden Iron Works, Civil War Round Table, Crailo State Historic Site, Franklin D. Roosevelt Presidential Library & Museum, Historic Cherry Hill, Guilderland Historical Society, Johnson Hall State Historic Site, Knox’s Headquarters State Historic Sites, New Windsor Cantonment, NYS Office of Parks, Recreation & Historic Preservation, Olana State Historic Site, Saratoga National Historical Park, Saratoga Racing & Hall of Fame, Schenectady Historical Society, Schoharie Crossing State Historic Site, U.S. Grant Cottage Historic Site, and U.S. Naval Landing Party. Admission is free. Further information about programs and events can be obtained by calling (518) 474-5877 or visiting the Museum website at www.nysm.nysed.gov. Passenger Pigeon Weekend at the Cincinnati Zoo. Held at the original home of Martha and co-sponsored by the Ohio Ornithological Society, this event includes a Friday night cocktail party, a Saturday symposium with Joel Greenberg and others, and birdwatching opportunities. Once There Were Billions: Vanished Birds of North America has been open since late June. Martha herself can be found here. 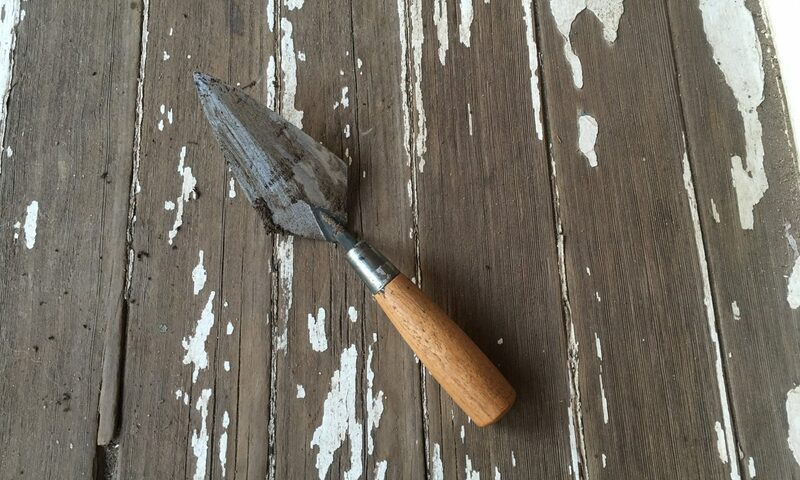 The Smithsonian is also having a twitterchat about Martha on September 2, 2-3 P.M. EST. Check out #Martha100. Eclipse consists of a massive 100-foot video projection, screens on the walls and ceiling of MASS MoCA’s four-story atrium. The video loop shows a flock of passenger pigeons in reverse-negative silhouette lifting out of a life-sized tree, accompanied by sound design consisting of layers of digitally processed human voices. The exhibition offers a space for reflection with a limited-edition artist publication that will include writings by Kolbert, original photography by Sayler/Morris, and archival images. Eclipse officially opens on September 1. Michael Pestel’s multimedia art exhibition Requiem, Ectopistes migratorious, “ metaphorically places Martha at the center of the installation in the form of a human-scale birdcage, encouraging visitors to contemplate extinction—of the passenger pigeon, of other species, and perhaps even author Elizabeth Kolbert’s The Sixth Extinction.” It opens September 1 with a presentation by the artist, music, and readings. On September 8, Steve Kuehn will give a talk entitled The Prehistory of “The Feathered Tempest”: Passenger Pigeon Zooarchaeology in the Upper Midwest focusing on pigeon bones from archaeological sites in Illinois and Wisconsin. The University of Michigan Museum of Natural History created this exhibit, which is being presented at many venues throughout the country, including the Florida Museum of Natural History, the New Jersey State Museum, and the Harbor Springs Area Historical Society. Many locales are supplementing the display with material from their own collections. New research question: Is it possible to write an article about passenger pigeons without using the adjective “stupendous”? This article in The Star uses it, while talking about the Royal Ontario Museum’s plan to put some of their 153 stuffed Ectopistes back on display, as well as how the DNA from one of their birds is being used in an ambitious plan to recreate the passenger pigeon. 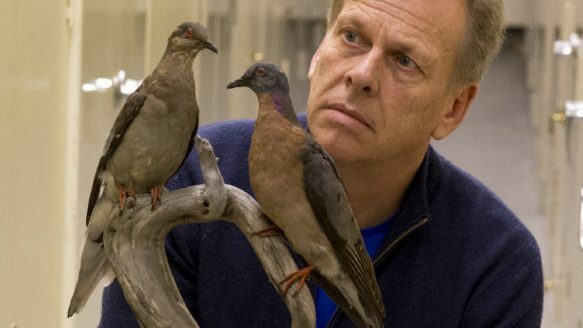 ROM curator Mark Peck with specimens from the museum’s collection of extinct passenger pigeons. Source: Keith Beaty / Toronto Star. Where Could You Buy a Passenger Pigeon in 1908? Source: New York State Museum Bulletin 121. 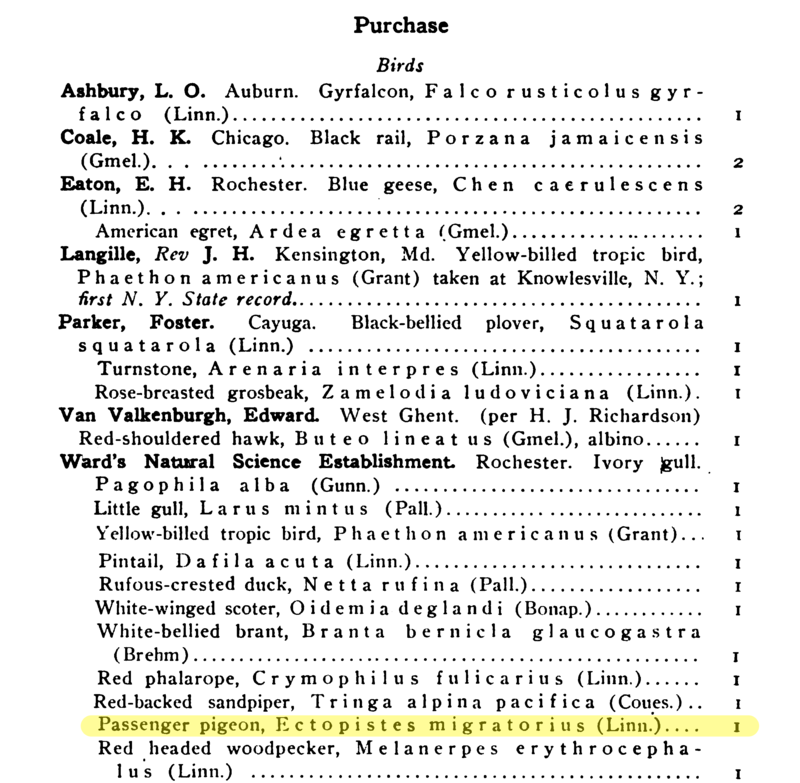 In 1908 the New York State Museum purchased a passenger pigeon from Ward’s Natural Science Establishment in Rochester, NY (NYSM 1908:134). The late date of this acquisition is interesting. By this time, the species was considered extinct in the wild. Martha, the last known passenger pigeon, of course, died in captivity in 1914. The latest confirmed killing of a passenger pigeon that Schorger (1955) was aware of occurred in 1900 in Ohio. Greenberg (2014) has since identified two more recent records: a passenger pigeon killed in Illinois in 1901 that survives as a taxidermic mount at Millikin University, and a pigeon killed in Indiana in 1902. That specimen has not survived. There were, however, unconfirmed sightings of passenger pigeons in the wild. Most, if not all of these, were likely misidentifications of the smaller mourning dove. Schorger has pointed out how even experienced observers could make such a mistake. The latest confirmed kill of a passenger pigeon in New York was in 1899. Yet a passenger pigeon nest was reported from Monroe County, New York, in 1904 and in 1907 Edmund Niles Huyck saw a live pigeon in Albany County and naturalist John Burroughs recorded sightings of flocks of pigeons in the Hudson Valley (Greenberg 2014; Steadman 1996). Is it possible that a collector working for Ward’s killed a wild passenger pigeon that was then sold to the Museum? Perhaps, although Ward’s Natural Science was a major supplier of passenger pigeons and all sorts of animals to museums and other institutions. It seems more likely that the State Museum bought a specimen prepared by Ward’s years earlier that had been sitting unsold in a warehouse. In fact, another source, Frank H. Ward himself, tells us that the company obtained their passenger pigeons the same way many other people did: by buying them in public markets in the 1880s. At the time of the death of Martha, the last passenger pigeon, in 1914, Ward’s still had eight skeletons in stock (Pitelka and Bryant 1942). The New York State Museum has several passenger pigeons in their collections — ten mounted skins according to David Steadman, the former curator of birds there. An earlier report listed five mounted specimens and two study skins at the museum, of which only one, a mounted specimen collected in 1895 from Orleans County, New York, had reliable provenience (Stoner 1940). The pigeon from Ward’s, whether a stuffed taxidermic mount or a mounted skeleton, is presumably still at the NYSM. Their products would have had a label with the name of the company, but this would not be considered provenience data, as it would not have the date and location the bird was actually obtained. A search of the museum’s archives and an examination of the bird itself might produce more information. The University of Rochester curates the archives of the Ward’s company (link), but a fire in 1930 destroyed many of the earlier records, so it may not possible to ever determine if this bird was truly one of the last wild passenger pigeons. 2014 A Feathered River Across the Sky: The Passenger Pigeon’s Flight to Extinction. Bloomsbury USA. 1908 Fourth Report of the Director of the Science Division including the 61st Report of the State Museum, the 27th Report of the State Geologist, and the Report of the State Paleontologist for 1907. New York State Museum Bulletin 121. Albany. 1942 Available skeletons of the passenger pigeon. The Condor 44:74-75. 1955 The Passenger Pigeon: Its Natural History and Extinction. 1996 …And live on pigeon pie: the passenger pigeon finally expired at the Victorian dining table. New York State Conservationist. April, pp. 21-23. 1940 Unreported New York State specimens of passenger pigeon. The Auk 57:415-416.